Quintessential New York glamour finds its home 65 stories above historic Rockefeller Center. Celebrate 2019 NYE with open bar at Rockefeller Center. Quintessential New York glamour finds its home 65 stories above historic Rockefeller Center. 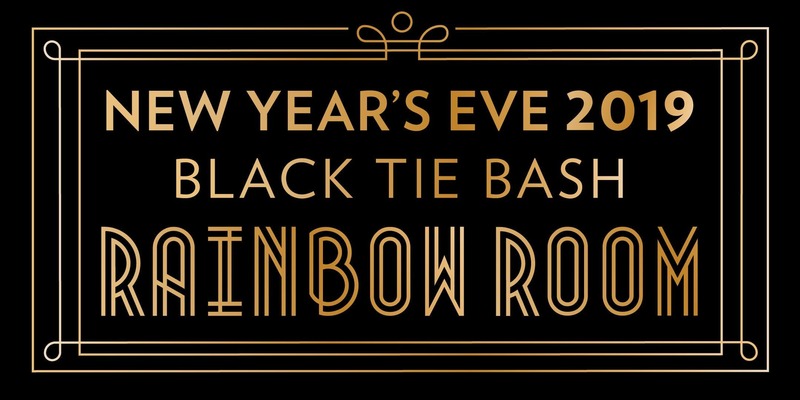 Crowning the timeless Manhattan skyline, the iconic Rainbow Room offers a modern twist on classic old-world charm, making it the perfect place to ring in 2019! Guests are invited to enjoy a premium open bar, passed canapes and magnificent views in The Gallery from 7:30 PM to 8:30 PM. *Menu upgrades available the night of for supplemental fee. Rainbow Room is located at 30 Rockefeller Plaza on the 65th Floor. Our official address is 49 West 49th Street, between Fifth and Sixth Avenues. Upon arrival, please enter underneath the 49th Street marquee, follow the red carpet and proceed up the escalator to the mezzanine level where you will be greeted by Rainbow Room hosts. Seating is assigned by the maitre d' based on the size of parties in attendance. Rest assured, every seat in the house will have a fantastic view. There are no refunds or exchanges for tickets. Just like a sporting event, concert, or theater ticket, all Black Tie Bash ticket sales are final. However, your ticket is transferable. The transferee must be 21 or over and have the printed ticket to present upon entering the venue.